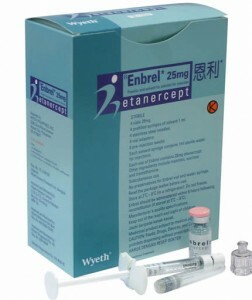 Enbrel - also known as Etanercept - is a Tumor Necrosis Factor inhibitor. TNF inhibitors stop the production of TNF in the body, relieving pain brought on by arthritis and other autoimmune disorders. It is used for treating patients suffering from autoimmune disorders such as rheumatoid arthritis, juvenile idiopathic arthritis, ankylosing spondylitis, psoriatic arthritis, and chronic plaque psoriasis. It is often prescribed as a long-term solution for chronic pain due to these illnesses, and can be utilized in children and adults. It is also often prescribed to the elderly who are suffering from arthritis. Medical offices distribute Enbrel. It comes in a solution and is injected into the body, under the skin (subcutaneously). Enbrel also comes in a prefilled syringe, complete with an injection device. The solution is usually administered about once per week, although every doctor’s prescription instructions may be different. The more serious the disorders, the heavier and more frequent doses of Enbrel are administered. Never consume any more or less than what is prescribed by your doctor. Doing so could result in permanent injury or death.